You look awesome with your floral dress Ms.Charlotte match with the colour of your wedge! love your sense of style - wish I were this fashionable ! I love the glasses and the dress! Lovely dress and you look stunning! Beautiful colors and pattern in the dress! Love your dress! I wish I could pull off that dress like you! What a beautiful outfit; I love the bag!! You look beautiful in this dress!! The shoes rock!! Love the floral dress. It looks great on you! So fashionable! <3 I love it. I love this look. The dress is very nice. I really like your dress. Very Pretty outfit. The bag is really pretty. I love florals.Your outfit is fabulous! I love your dress and you look so pretty. Nothing more feminine than floral prints! I just love some of these clothes ,although most are to young for me. Gorgeous pictures and model. Like the floral prints. Glad to see them coming back. Love how you look in that dress!! I love the dress, and the way the purse pops! That is cute on you but a little too much floral for my body type. Wow. Those glasses look super stylish ! I love your bag and those quirky glasses. Love your style. You're so talented and smart. Thank you for the chance! Great outfit, I like the dress. Cute dress. I love florals and bright colors, too. However, unlike many others here, I am not such a fan of the glasses. I realize that you consider them your signature, but they are always so big that I feel like you're hiding behind them. You're beautiful and you should reveal your face and eyes more. Have fun with the glasses, for sure, but make sure they're not a "crutch." I say this not to be critical but encouraging, and hope that you take my comment in that spirit. It's a cute dress, I love flowers! Nice suit. I love the pattern! A nice dress! I love it! Love your dress, your gorgeous. i love the dress. i love floral dress. Loved the floral elements in the dress,..
Beautiful look! Glasses are best ! I love the dress, I think it would also look great as a tunic. Fashionista! Love the florals...very pretty. It looks very cute on you. love your sense of style, you're cute. The dress is really pretty, love the glasses. I like the glasses and the dress! I really like the outfit. I really like the style. I love the glasses and the dress! You look lovely! Beautiful dress! Love the glasses! Cute dress, I love the purse and your glasses, great accessories! Wow. you LOOK STUNNING!! & that dress is BEAUTIFUL!! You sure know how to rock a floral dress! Lovely dress wish it fit me. You look so cute in this dress! Love the roses...nice legs! the dress is lovely. the color is appealling to the eye. I LOVE YOUR OUTFITS. OMG!!!! THERE SO PRETTY. GREAT WEBSITE. Love your collection:) Expecially the floral one, looks great on you. You pull off that dress very well! Not everybody could! Love your glasses. I don't know if I like your look or the words in this post the best....they are both so pretty!! Thanks so much for sharing your inspiration. Nice dress. Very pretty and you look very good in it. You rock that look. I love the glasses! Lookin' gorgeous, love the florals ! Very nice fashion Ms.Charlotte! I am in my 30s and still can't dress as nicely as you. You make floral look good! I just ordered a floral romper along with a dress and soft pants. Can't wait to wear them!!! So in love with the Floral dress. Love the dress but hate the glasses. Really look beautiful ... florals work. I don't think anyone else could pull off those glasses like you! I love your dress and your glasses are really cool. Thank you for sharing. GREAT outfit! I love florals! I like your floral dress and the glasses are awesome. I only have one floral print in my closet. I guess it's time to go shopping! 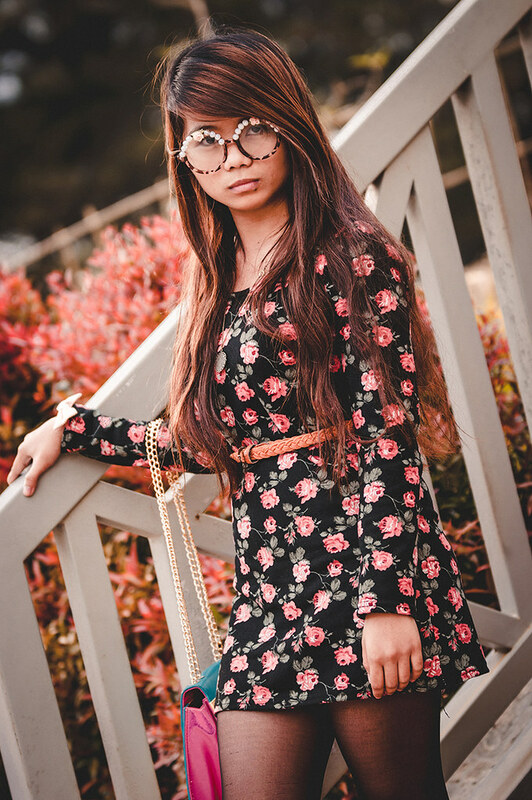 Loving this floral dress! I tend to wear more florals in spring but I think I need to change that. I love the dress looks so god on you. The floral dress, you just can't go wrong in a floral dress and especially not in a leather jacket. Hope i win it. I love the floral combination in the dress and glasses - and the way the shoes match. So pretty and feminine. Thanks for sharing your thoughts Charlotte - so insightful.